A bet of the Area Tenerife 2030 of the Cabildo Insular of Tenerife to contribute to a greater awareness about the emission of polluting gases to the atmosphere, the quality of air and the climate change climate – ITER – Instituto Tecnológico y de Energías Renovables, S.A. 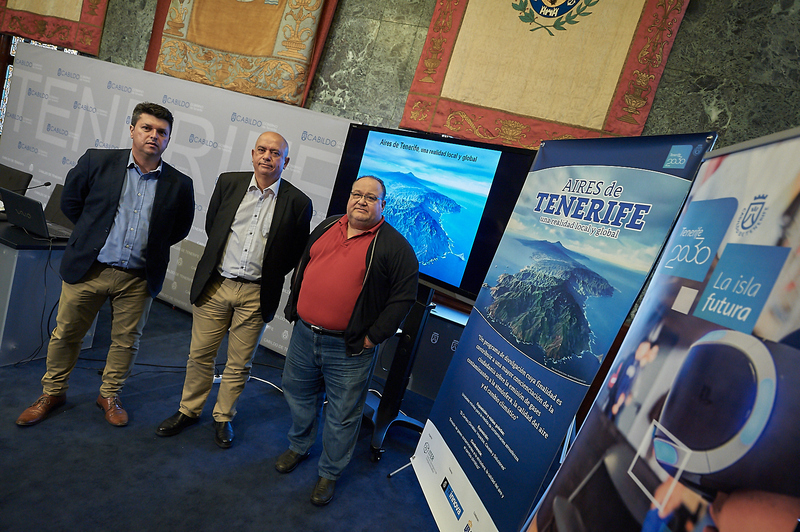 The educational program “Aires de Tenerife, a local and global reality” will visit the 31 municipalities of the island of Tenerife by the hand of ITER´s environmental area thanks to the Innova Tenerife program 2016-2021, coordinated by the Area Tenerife 2030: innovation, education, culture and sports of the Cabildo Insular of Tenerife. The purpose of this educational project, which will take place during 2017-2018, is to contribute to a greater awareness of citizenship on the emission of polluting gases into the atmosphere, the air quality and global climate change. This program counts with the collaboration of the Ministry of Education and Universities of the Canary Islands, given that it will be implemented in educational institutions of the Ministry in Tenerife, and of the Tenerife Energy Agency. The program begins its journey around the island in the municipality of Icod de los Vinos, more specifically in the I.E.S. Arico, that will host the program from the 20 to the 23 of February 2017. During one week, an atmosphere pollutant (SO2, NO, CO, or3 and PM10 particles) intake level monitoring mobile unit of the Cabildo will be installed in each of the selected schools within the framework of the program. The school will enjoy of a guided visit to this mobile unit of the Cabildo Insular, operated by ITER, as well as a guided visits to an ITER´s vehicle equipped with COSPEC and miniDOAS remote optical sensors, capable of performing remote measures, in land mobile position, of atmospheric pollutants emission levels (SO2 and not2 ). Parallelly, during that same week the centers will also have a Climate Change exhibition, made up of 17 informational and educational panels, created within the European Project of Educational Action for Climate, Clarity. The Spanish version of this exhibition has been prepared by the National Center of environmental education under the scientific supervision of the Spanish Office for climate change and aims to contribute to the knowledge of the phenomenon of climate change, its causes and responses that are arising to deal with it. Also the documentary An Inconvenient truth and Before the Flood will be screened throughout the week, showing the devastating effects of climate change. In order to foster their interest in the social sciences and assess the degree of awareness that the residents of their municipality have on air pollution, rational use of energy, energy saving and the climate change overall, the students will carry out a social research project as part of this educational program. The educational program ends its visit to the municipality with a talk/discussion led by researchers of ITER´s environmental area about the topics explained above.